Our knock out rose bush leaves have whitish spots on them. Is this insects or disease? They seem to be growing well, but I'm afraid they will die if the spots on them continue. The white spots could be Mealy Bugs or perhaps Spider Mites. They could also be the beginnings of Powdering Mildew or could be dust particles from something being applied in a neighboring property. Could also be ash from a fire if there have been any in the area. The action to take is to see if the spots can be dusted off with just a flick of the foliage, or if the spots move when you touch the foliage. If they move then then are likely mealy bugs or spider mites, an application of Insecticidal Soap mix should gain control. 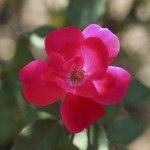 If the spots do not dust off and do not move, it might be a good idea to spray the rosebushes down with a good fungicide such as earth friendly Green Cure. You can purchase Green Cure on-line.